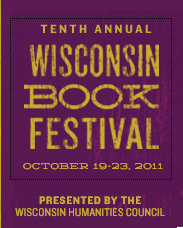 While it's officially a book festival, the Wisconsin Book Fest will be screening our Mad City Chickens film on this Wednesday, October 19th in Madison. Show starts at 8:00 pm at the brand new Union South Marquee Theater. Screening follows CLUCK book presentation by author Susan Troller and artist S.V. Medaris (both appear in the film). And both Tashai and Robert will be present at the screening answering questions and selling chicken DVDs and swag. Free admission.